Perhaps the most profound form of memory keeping is documenting thankfulness. Documenting our gratitude for life’s blessings can transform our lives. This is a beautiful form of memory keeping. Each of these gifts is a piece of my story. I think a personal gratitude journal is something that anyone can start, and a legacy of thankfulness is a beautiful one to leave. I think every single family should own one of these books. 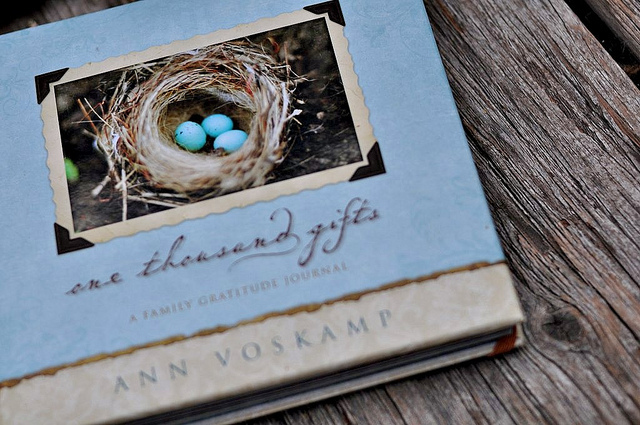 Truly, if this series motivates you to do anything, I hope it motives you to purchase a family gratitude journal. I think it is that important and meaningful. 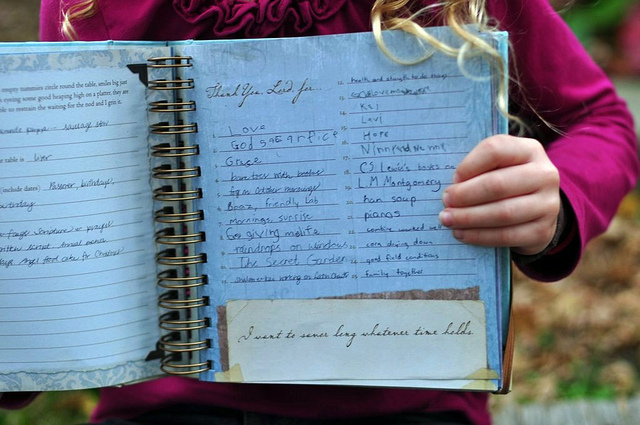 The journal can be used in a host of different ways. Each family member can record what they are thankful for or a family scribe can write down the day’s blessings. I love the idea of incorporating your child’s handwriting in the book. Like the birthday book that I love, it includes pockets for special mementos and spots for pictures. It is easy to do (no matter how busy you are!) and the finished product is one that will be treasured in your family for years to come. Imagine looking back in 20 years on the things your six-year-old was grateful for. Instilling gratitude in our children’s lives from a young age is a attribute that will bless them their whole lives. And by discussing and recording things we are thankful for, life change happens. Already, the more we talk about blessings with Elias (who is just three), the more thoughtful he seems to become. Prayer time often includes thanks for his teachers, his friends, even Buzz Lightyear and pumpkins. 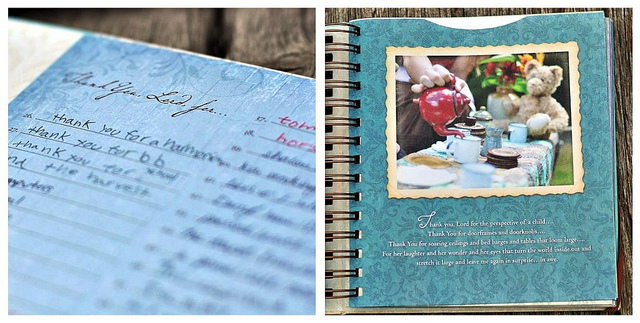 This gratitude journal is a wonderful memory keeping tool for documenting your family’s blessings. And with Thanksgiving a month away, it seems like the perfect time to start documenting thankfulness, doesn’t it? 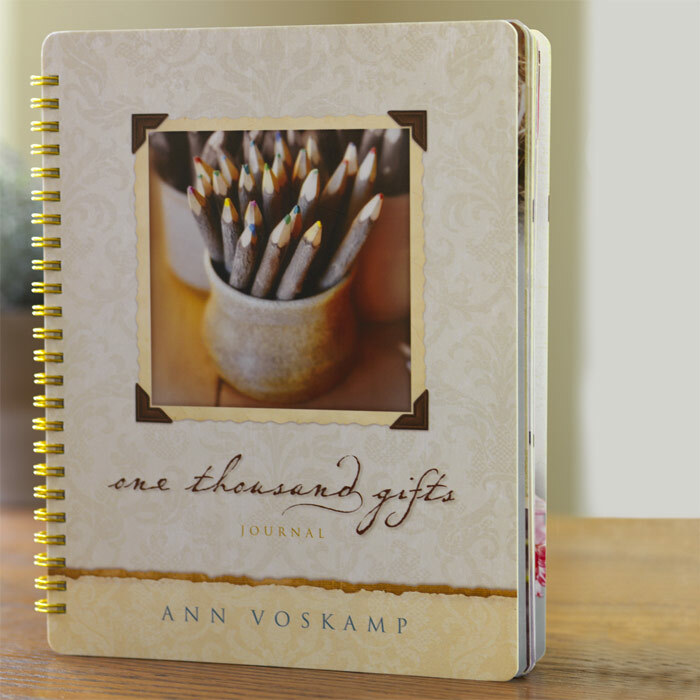 Today, buy one of these gratitude journals and make a commitment to pursue gratitude as a family. Special thanks to my sweet friend and confidant Ann Voskamp for the photos and, more importantly, for inspiring and motivating me to live a life of eucharisteo, giving thanks in all circumstances. This is the 26th day in a series: 31 Days of Memory Keeping. Check out all the posts here. Such a lovely journal. I too, started keeping a gratitude list after reading Ann’s book, but would love to have this gratitude journal to accompany my book and list. 🙂 It’s now on my Christmas list! Thanks for sharing this great journal! I started a Gratitude journal in 1998 or 1999 after reading Sarah Ban Breathnach’s book Simple Abundance. I have gone years without writing in one, and just found an old one and started writing in it again. It has entries from 2000, 2001, 2003, 2005 and now 2011. It may be the only place I wrote about my husband proposing. I wish I’d kept it up over the years! I write at least 5 things that I’m grateful for, and it’s almost always little things about the day. It’s only if I’ve had a really bad day that I write about the bigger things. I want to check this book out! Thank you for this – I need to start journaling more. I just recieved one of the journals I ordered using your freebie code and oh my goodness! I have used alot of online photo product companies but I was blown away by how BEAUTIFUL it was. It made me so excited to recieve all the other stuff I ordered (for practically nothing, thanks to you). Thank you so much for introducing me to this fabulous company! Thank you, thank you, thank you!!! Yay! I know, they are AMAZING! !